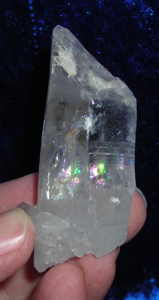 Crystal Genn » CRYSTAL HOW-TO » RAINBOWS IN CRYSTALS – WHAT ARE THEY !? RAINBOWS IN CRYSTALS – WHAT ARE THEY !? If you’ve ever had the opportunity to see Rainbows in a crystal, it is a beautiful thing! If so, you’re in luck. We’ll talk a little about that in this blog post. Let’s start by looking at some Rainbows in crystals! METAPHYSICALLY, WHAT DO RAINBOWS IN CRYSTALS REPRESENT? In a nutshell, Rainbows in crystals represent hope and optimism. A description I read long ago which I liked was: “Rainbows are a gift from the Spirit Keeper of the crystal”. I liked it because the saying is so poetic and concise. But I didn’t take the part about the Keeper 100% literally. There is much more to this concept so I am making a separate blog post about it (stay tuned!). Regarding the reference to the “Spirit Keeper” of the crystal: The “Spirit Keeper” might be described as the crystalline energy and consciousness of crystal interacting with the physical vehicle or body of crystal, and hence the description of there being a Spirit Keeper is very accurate if you take it in this context. At any rate, Rainbows carry a happy joyous energy and are uplifting. It is like finding a special surprise in the crystal that is there just for you! I say it this way because normally seeing a Rainbow requires us to interact with the crystal in order to SEE the Rainbow (we must turn it to get the light in such a way that the Rainbow “appears” for us), therein lies the “gift”! Of course, the Rainbow is ever present, but we don’t see it until we interact with the crystal. 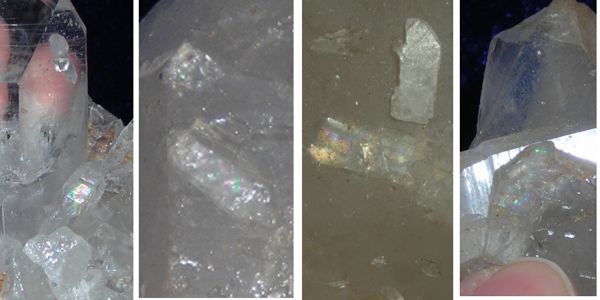 As we discussed earlier, Rainbows are usually caused (physically) by some sort of damage to the inside of a crystal. Either physical damage: such as out-of-the-Earth dropping, or inside-the-Earth movement from quakes and shakes. Sometimes they’re caused by shocks or traumas such as extreme temperature changes. Metaphysically, the Rainbow represents how external pressures (physical or emotional) create an area for a Rainbow to appear. Without having experienced the damage, the Rainbow wouldn’t have had the opportunity to be formed, so wouldn’t be able to lift us. The same can be said for our human traumas, shocks and challenges. Once the trauma is complete and we are on the healing side of it, we may have to “turn” our trauma about a bit. Get a different look at it, in bright light. Twist the experience around and look beneath the forming scars to find the gift or the rainbow. I know it is true for me, (with the benefit of hindsight) major traumas in my life have always brought unexpected gifts (rainbows) with them. The gifts weren’t always obvious at first blush. I had to get out the bright light and turn the experience about a bit. WHAT ABOUT RAINBOWS BETWEEN FUSED CRYSTALS? 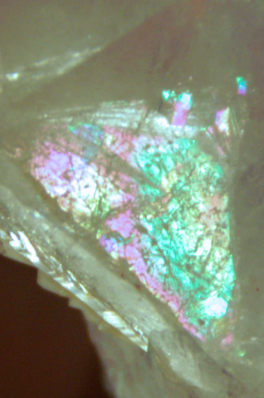 There are also Rainbows which appear on the surface between two closely connected (fused) crystals. Metaphorically, this can represent how a relationship with a closely-attached-other can bring us Rainbows. 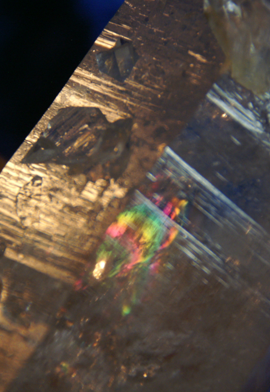 Often the fusing of the two crystals produces a surface on which Rainbows like to ride. If the crystals become unfused (which is what leaves behind crystal Imprints), the Rainbow disappears. 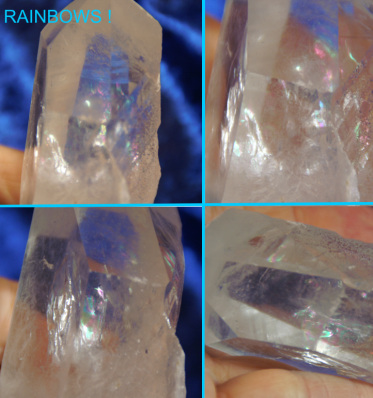 It is the interaction between the fused crystals that produces the beauty of the Rainbow. The bottom line is the relationship with the closely-attached-other creates a Rainbow to be explored and honored while the two are connected. I hope you have found some insight about Rainbows in crystals after reading this post. 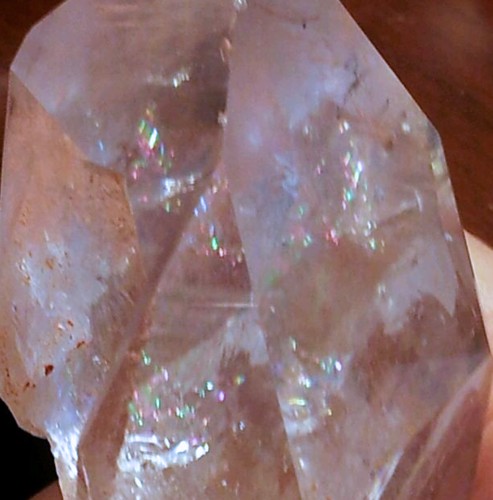 Consider twisting and turning your crystals in bright light to look for possible Rainbows. If you’re not sure where to start, typically, you will find them in crystals which are Empathic. Empathic crystals are those which are chipped, dinged or damaged in some way. Remember I said lots of crystals which have sustained damage will also have Rainbows. Crystals which have sustained the most trauma tend to have some incredible beauty, caused by that very trauma! Use this as a metaphor to tip and turn your human traumas to look for the Rainbows the challenges brought you. Look at the space between you and your closely-attached-others to see if there is a rainbow gift riding there, waiting for you to discover it while you are still connected. If you are looking for crystals that have Rainbows, you might find something that resonates with you at my store Arkansas Crystal Works, under the heading of TYPE – Rainbow. Do you have a Rainbow experience to share? We’d love to read it in the comments! 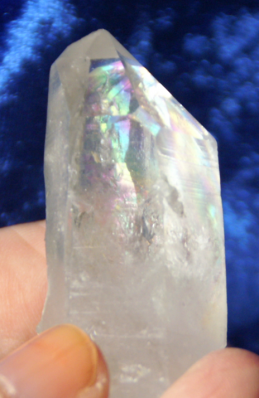 Tagged crystal types: rainbow, metaphysical descriptions. Bookmark the permalink. Genn John has been acting as the legs for the Crystal People as the Keeper at Arkansas Crystal Works, an internet-based source for crystals and crystal knowledge, since 1995. Having accepted the honor to be their voice as well, she is the author of Understanding The Crystal People: A Handbook for Lightworkers; a crystal reference book for people who desire to fully understand their connection to the crystal kingdom and who wish to enhance their working knowledge of these majestic beings. Genn has also published a 4 part series of coloring books which are a useful tool for anyone with an interest in learning the anatomical structures of quartz crystals. It features precise, extraordinary hand-drawn designs crafted especially for easy coloring and interactive study. Find the store and more at www.arkansascrystalworks.com, or her blog at www.crystalgenn.com. To connect: email - genn@arkansascrystalworks.com, facebook - https://www.facebook.com/ArkansasCrystalWorks, Instagram - gennjohn or Twitter @GennJohn. 2 Responses to RAINBOWS IN CRYSTALS – WHAT ARE THEY !? I recently completed surgery and radiation for breast cancer and as a next step for treatment have been guided to crystals, prayer and meditation. I say that because once the Dr.s finished with my body, my mind said “what next?” That’s when I received a rose quartz bracelet from my BFF which I took as “here you go” and I haven’t stopped enjoying the learning and happiness I’ve received. 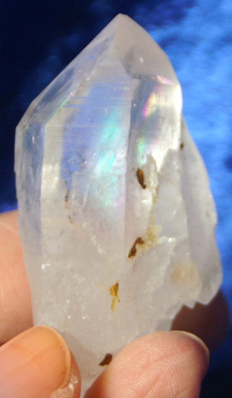 My mother had a piece of quartz crystal that my grandfather (born in 1902 youngest of 12) played with as a child. It is such a gift and another sign I am on a healing path! Thank you for your story and website! It’s both moved me and moved me forward with my spiritual journey. I feel blessed!